I let that sink in a bit with my 3 kids, standing in the Ontario summer twilight. We’d just driven over 11 hours from our family cottage in the U.P. of Michigan to Armstrong, Ontario, a scruffy railroad town at the end of the road that would serve as our launch point for an 8 day canoe trip through Wabakimi Provincial Park. 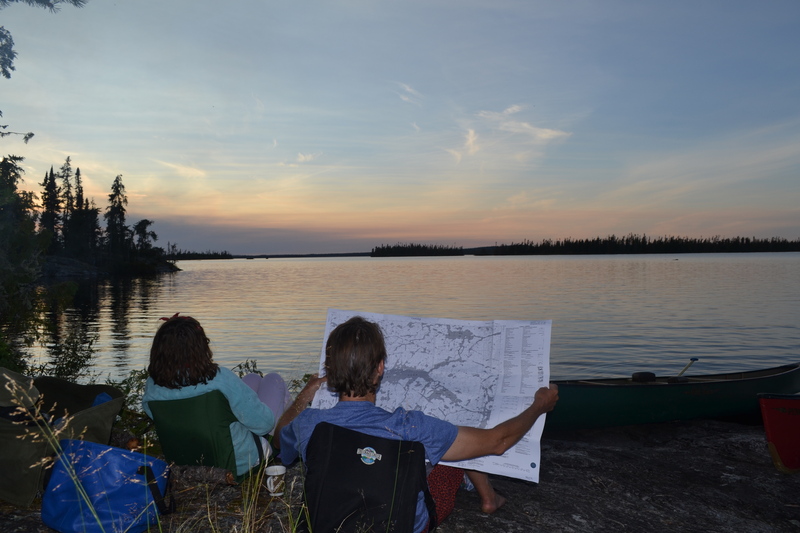 Located in western Ontario, Wabakimi park is 2.3 million acres in size and holds hundreds of lakes, rivers and streams. It is twice the size of the Boundary Waters canoe wilderness and receives only a few hundred canoeists each year to the BWCA’s 250,000. A wild place in a shrinking world. 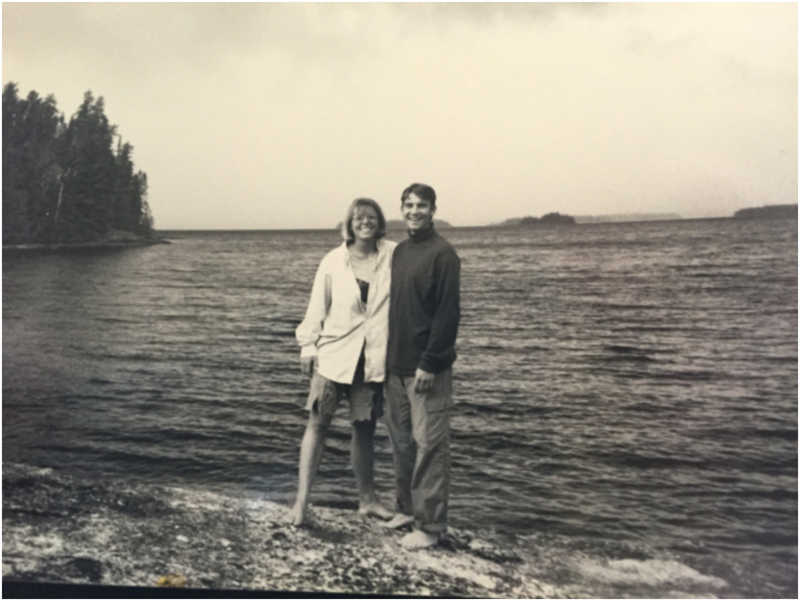 The last time I was in Wabakimi, I was young man, and my wife Sarah and I were on our honeymoon. It was 1993 and I was 24 years old. I was still in school. I had no career, no kids, no mortgage. Everything was new and opening before me. We almost didn’t make this trip. Wilderness canoe trips are hard work. They take a lot of careful planning of food and gear. They push you physically and mentally with long hours of paddling, buggy portages through muck, and the ever-present risk of disaster. You are at the mercy of the weather and the wilds. You sleep on the ground; you go to the bathroom in the woods. If something bad happens, you are on your own. A few days before the trip, as the risk sunk in, I suggested to Sarah that it might be easier and more relaxing to just spend time at our cottage, sleeping in doors and taking day trips to paddle or explore. We put it to the kids. “No way!” they said. “We can always go to the cottage, but we might never get the chance to go to Wabakimi as a family again.” Enough said. My kids have been on wilderness trips, and they know they aren’t easy. But on past trips—after a few days—I’ve seen the girls wake from the attention deficit world in which they live with buzzing phones and multiple screens and constant stimulation. I’ve seen them look up from that networked fog and feel freedom, and they wanted that space for our McGuire 5 now, before we scattered to a new normal. I was very proud to see them choose an adventure. Back to Wabakimi we would go. I can barely hear Corky, my future father-in-law, yelling over the all-encompassing roar of a mid-day storm that catches our canoe group by surprise. He lets out another war whoop and another and jumps onto an aluminum canoe that had been picked up by the wind and is rolling down the rocky shore towards the depths of Smoothrock lake. The year is 1989. 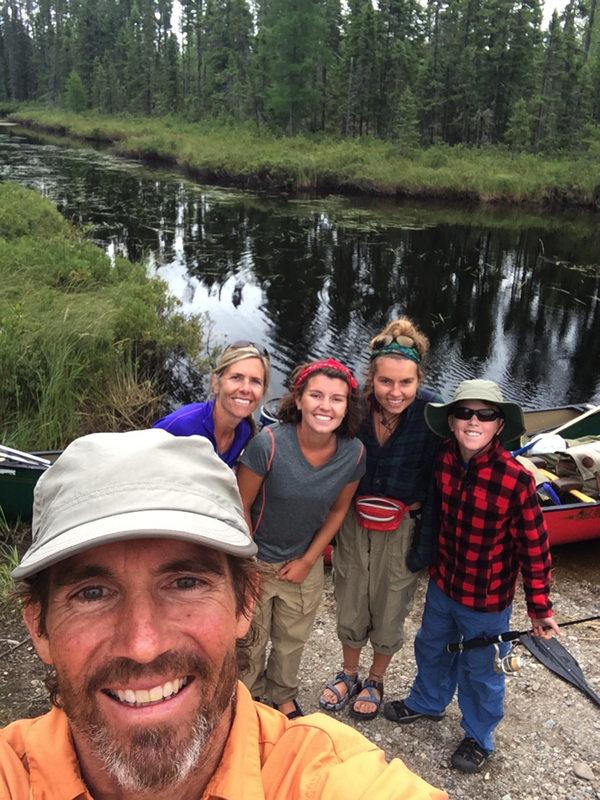 I’m on my first trip with “Esacape to Wabakimi,” an outdoor adventure company that Corky ran out of the University of Wisconsin-Madison that delivered people from all walks of life into the Wabakimi Wilderness on 8-day canoe trips. His daughter Sarah and the rest of our 10 person group are all in their tents back up in the woods, trying to hold everything in place while we weather the sudden storm. Our camp rain tarp shreds and flies off. Then another canoe flips over and starts leaving for places unknown. I jump on and let out a yell of my own. We hang on, soaking wet and on the edge of disaster. The storm lasts 15 minutes, the sun comes out and Corky and I give each other a hug and check on the rest of the group. I’d never felt more alive. I was now standing on that exact shoreline on Smoothrock Lake with my family, more than 25 years later. It’s Day 5 of our trip, and we had just pulled up from a really long day of paddling. In typical Smoothrock fashion, a huge storm chased us off the lake and to the shelter of an island a few hours before and the five of us sat yelling and laughing and singing in the driving rain and lightening and thunder for a few hours. We had just arrived at this camp and were now shivering cold and focused on getting the tent set up, a fire going and warm food in our bellies. But I had to look at that spot on the smooth granite shoreline. It was still there. The campsite was overgrown, but that shore was still there. Still the same. I felt like I’d just closed a really big circle, one that took decades and brought lots of exciting changes to my life. 25 years. I’d made it back here. And I brought with me 3 amazing new people that called me Dad and looked to me when they were lost or scared or needed help. And I came with my girlfriend Sarah, who was now my wife and part of it all. Amazing. The next morning, we paddled away from that campsite really proud. The girls had set up the tent the night before in record time to keep us dry from another impending storm. Sarah made a hot meal in the rain and fading light. Jimmy and I channeled our inner Bear Grylls, using a hatchet to get to the dry interior of a jack pine and make a hot fire. We slept warm and dry and safe that night. The confidence that comes from self-reliance in the woods is an amazing part of these trips. I hope my kids use it as a springboard for having confidence in the “real world” as I’ve done. As we paddled away in the warm morning sunshine, I looked back at that Smoothrock camp. I looked back and thought about Corky, who was now living with dementia in an assisted care facility back in Madison, unable to care for himself. I could still hear his war whoop echoing there, yet his time in places like this has passed. He will never be here again. And I told the kids what I was thinking; life is fragile and fleeting. Don’t sit back and let life happen to you. Attack your life. Take risks. Do what makes you come alive. Make it count. I looked one last time back at the campsite, getting smaller in the distance, and then I turned away. Pure joy. That’s what I was feeling. It’s the morning of Day 4. We are on our longest portage of the trip, which takes us onto River Bay of Wabakimi Lake in the heart of the park. At over 800m, the portage was long enough that we decided to camp just before it the night before, making far less progress than originally planned. But this morning, as I walk back across the portage to get the second canoe, pure joy builds within me. I feel like a kid riding his new bike. Like I’ve broken the tape at the Boston Marathon. The portage is amazing. Following the river rapids at the start, it quickly turns off into an open, old growth forest of jack pine. Up and over smooth sections of exposed Canadian shield, on a footpath of dry moss that deadens each footfall, it is covered in blueberries, which I’m eating by the handful. Shafts of warm morning sun cut through to the trail. I’m thinking about my 12-year-old son on the end of the portage, who I had just come upon laying on his back at the lakeshore. He tells me “Dad, my life is complete.” He had just landed the largest Northern Pike of the trip-his personal record-and then released it back to the water by himself. He was so amped up that he needed to lie down for a moment. He will remember that fish forever. I breathe in deeply and smell the damp, organic forest. I almost can’t contain my joy at being alive. At leading my family on this trip and the experiences that are unfolding. I pass my girls and wife walking the other way on the trail and give them each a high five. They are so beautiful. So perfect. I eat more berries, and thank God that I can be here, in this moment, strong and full and alive. Why does this type of child-like joy rise up on wilderness trips but not back in our modern lives? Life is about contrast. You can’t have a front without a back, light without dark, strength without weakness. The night before, this woods had felt sinister in the creeping darkness. I was bone tired after doing two portages earlier that day in overgrown alder swamp so thick that getting lost was a big concern. My kids were crabby and tired too. I was worried the whole trip would be a struggle like this and that I was putting my family at risk. Would we make it out of here safely? But this morning . . . The sun shines warmly, we’re feeling strong, and the wilderness gives us an easy path through. That contrast-the dark fear and exhaustion turning to beauty and strength-is what brought the joy out in me. Back in our daily lives we don’t often push ourselves in this way. Things are cushy. Most of us don’t get physically exhausted or fear for our safety, making a walk like this in the woods back home nice, but lacking the deep feeling that contrast brings about. True beauty-the kind that starts in your core-comes about because it stands apart from the darkness, perching above it, perilously. You know it is fragile and you embrace it and breathe it in and try to hold onto it. That morning, that portage trail, I was breathing in the beauty of my kids’ childhood, my role as their Dad, the family that Sarah and I had made together. The four of them have made my life beautiful. This moment, again, I felt truly alive. It’s Day 8, the last day of our trip. We are paddling down Little Caribou Lake to a road at the edge of the wilderness. The night before, I stood outside of our tent in the dark listening to Sarah and the kids laughing and wrestling as they sorted out their tent space and who got to sleep on the “surprise” rock or tree root that had emerged underneath them. I listened to Maddie and Jimmy beat on each other and Caitlin try to organize her spot and keep them at bay. Listened to them call each other the silly nicknames that we’ve invented on this trip. And a thought came to me: We have to go back to the land of wheels tomorrow. We won’t feel this sense of earned distance that we’ve enjoyed each night as we look at the maps, and gauge how far our bodies have retraced the miles that the float plane covered taking us out here over a week ago. The wheels and roads will quickly whisk us back to a place where we are consumers again. Where our every whim is instantly taken care of by the technology that surrounds us and insulates us. Where we demand things to always be bigger and faster and easier. Cheaper. Where covering hundreds of miles sitting in a cushioned car seat will feel boring rather than magical. Where we won’t give a moments notice when we hit a dragonfly that flies up into the car windshield even though we carefully rescued another of his kind not two days ago by a stream, laying it gently on a rock to dry its wings and celebrating when it flew up and away. The wheels will make us impatient and greedy again; less likely to enjoy each moment fully and slowly embrace each day as it unfolds because there is always someplace to be and something more to be doing in a hurry. The wheels will hide the natural, ancient rhythms that we’ve started to notice-a change in the wind, the rise of the moon later each night, the spinning of stars. All of these things, that feel so right and natural, will again fade into the background of regular life. Do we have to go back? 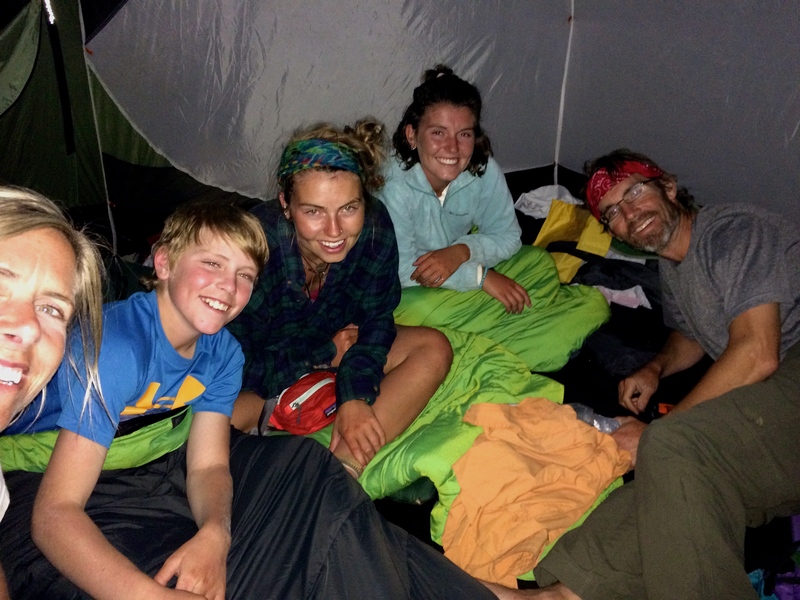 I climb into the tent and lay down, joining the chatter and jostling for space with my family as we squirm around like a bag full of caterpillars. As things quiet and we drift off to sleep, I reach across the tent, across my three kids and touch my wife’s outstretched hand. Nothing needs to be said. The moment sits there above the future unknown, fragile and beautiful. The next day, we round the last corner of Little Caribou, paddle across a small bay and step out at the gravel boat launch and onto a road that suddenly appears from the wilderness. We made it! The five of us stand in a circle and hug. Not a polite hug that you often hand out back at home. But a deep embrace that signifies that you’ve just spent 24/7 together for the last 8 days. Eating, sleeping, laughing, complaining, worrying, arguing, teasing, looking out for each other, together. Always together. You are in that moment a tribe, something that runs deeps inside of you and at the core of what it means to be human. Something ancient that bubbles up from all of the tribes of all of humanity that have formed like this over the millennia and made our species a success. This feeling that comes from wilderness travel is deep in the core of our existence. And we feel it now in that embrace. And it makes us that much closer, together. You can’t get this feeling taking a trip to Disney World. There are too many distractions, too many interruptions, too much to see and do and check off rather than just to be in the moment in a 100% commitment with your tribe towards a shared goal. You can retreat at anytime indoors, or to your phone, or some other place of distracted convenience. Retreat from the simple way of traveling under your own power, out there. Which is why I’m deeply thankful that places like Wabakimi still exist and that people still fight for them to be protected. And thankful that tribes can still be formed and confidence built and beauty felt. And that we can still move and experience things at a human pace that feels innately familiar and right. We take an end of the trip selfie and wait for our outfitter, Mattice Lake, to show up with our car. Where are they? 8 days ago, this delay would have put all of us in a bad mood. We would have been bitching about the service and our altered checklist for the day. Consumers. But today, it’s an opportunity to pick more berries and stroll around looking at things. We all feel so calm and able to enjoy and live in each moment that is presented. And it only took a little over a week. It is amazing how much life you can live in 8 short days. The car is here. We load up and start driving out and back to the real world. A big raven flaps up from the road in front of us. Years ago, we picked spirit animals with the kids in the tradition of many Native American tribes. An animal that touches you in some way and that helps guide you. This raven, my spirit animal, flies up in front of the car. We watch it, expecting it to turn and retreat into the woods like birds are supposed to do when you’re driving at them. But this raven doesn’t retreat. Instead, it continues to fly directly in front of our car windshield, maybe 20 yards in front of us, for miles. Miles of gravel road on which our car averages around 20 miles an hour. That raven stays there, out of front of us, slowly rounding each corner of the road and guiding us out. “Are you kidding me?” I ask, mostly to myself. We all just watch that bird flying there, our mouths open. No one really says much, as we are suspended in the moment, watching this strange event unfold. Just before Armstrong, the raven turns and flies off. I see it one last time, far across a big bog and then it is gone. 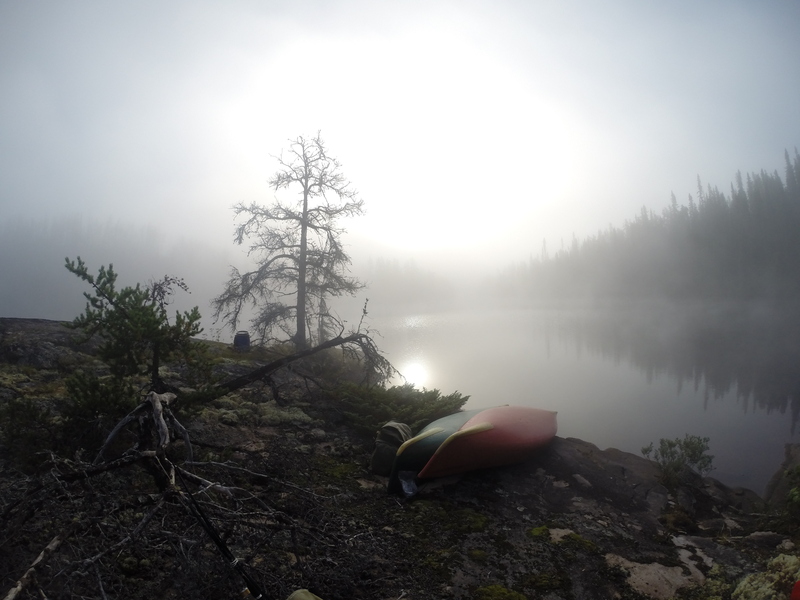 A few days before, we had made camp at the bottom of Lower Wabakimi Lake where it empties through a series of rapids and little lakes into the Caribou river system. I dropped a pinch of pipe tobacco into the water that night at sunset, another random tradition that we adopted from Native American cultures. On this particular night, I felt an echo. Like the echo I could hear of Corky whooping it up during that Smoothrock storm. It was there just the same. It was an extended family of Ojibwa that lived here. I could feel a kind-hearted old man that lived among them. He was watching the sunset. He loved his family and this place. It made him who he was. His echo was here, like a shadow. Or a whisper. 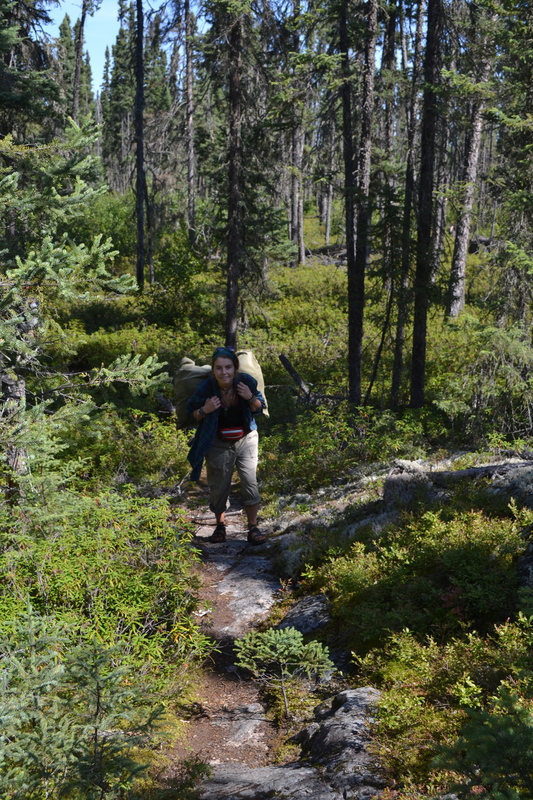 I felt him a few more times as we journeyed down and into Caribou Lake the next day. He seemed to be traveling with us, and then I turned away as we met a fishing boat on the portage at Caribou Lake and he was gone. Was that raven the old man? Was he saying that we earned his respect as he guided us out? I kept hearing him ask me: what will you do back in the real world for this place and other wild places like it? For your people? Do something special. Make your time count. I will try old man. I promise I will try. I keep a journal with each of my daughters. We started them back in the 7th grade stage when they were growing distant and I needed to find different ways to reach them. I think about what to write in my final journal entry to Maddie and Caitlin before they head to college. And Wabakimi surfaces again, and our decision to take the trip rather than be safe and easy. It occurs to me that I’ve made decisions like this on many occasions during my adult life. Decisions to do something risky and hard and scary challenging instead of easy and safe and known. And lots of those decisions, whether they were to go to law school, or become a Father, or start my own business, or do an Ironman or quit a cushy job at Microsoft, were often really hard and scary. If I failed, there were serious consequences. I needed to be prepared and focused or I’d be in a world of hurt. To trust my abilities. Those decisions pushed me. There were times when I questioned what in the world I was doing. But I believed in myself, stayed sharp, and pushed through. Some of them didn’t work out, but I always came out the other side thankful that I followed that path. That I attacked life and took risks and made my days count towards things that made me come alive. It was the same feeling I had standing with my family posing for the selfie on the boat launch after our trip. A Wabakimi choice. That’s what I wrote in their journals. Remember that feeling at the end of our trip. Make lots of Wabakimi choices this year Maddie. Make lots of Wabakimi choices Caitlin. Be thankful you have decisions like this to make in your lives. Make your days count. And I know you’ll create beauty that rises above things, high up above the risk and the pain and the endings of life. Up there, balancing for us to enjoy, while it lasts. Wow, thank you so much for sharing this. It is so important and you are a huge inspiration. I hope the sabbatical continues to bring all of you these experiences. Thanks Kellianne! Glad to hear you are back in Wisconsin.